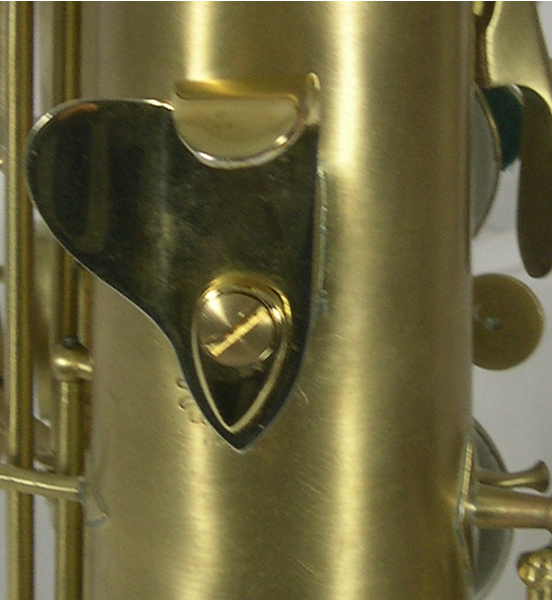 Vintage instruments with one-piece soldered-on thumb rests often cause discomfort in the thumb and wrist. Modern style thumb rests can be added to any vintage instrument for comfort and adjustability. In some cases, the soldered-on thumb rest need only be moved to a new angle or location to improve comfort and ease tension. Here, an adjustable “Comfort Rest” has been added to a vintage Buescher. This extra large right hand thumb rest provides support for the entire thumb.